A winterscape of wit and winsomeness, Aardman Animations' Arthur Christmas careens into the well-populated yuletide movie genre but manages to cordon off its own corner of the Santa mythos. The most brilliant stroke of Peter Baynham (Borat) and director Sarah Smith’s screenplay is reimagining the title of Santa Claus as a royal lineage, an ancestral birthright passed from father to son over generations. When mechanization fails to deliver a new bike to Gwen in the tiny hamlet of Trelaw, England (not Mexico, as several characters will discover), Steve chalks up the mishap as an acceptable margin of error. This does not sit well with Arthur (James McAvoy), Santa’s goofy, diffident son, whose throwaway job of corresponding with “Dear Santa” letter writers coincides nicely with his idealistic notions of Christmas. Indeed, the presence of the pure-hearted yet daft and out-of-date Grandsanta alludes to the male-centricity of the Santa lore and the traditional holiday stories that have sprung around it. The lesson of Arthur Christmas is not progress is bad, but that progress that forsakes one’s core values isn’t progressive. The celebrity voice-work is terrific throughout, particularly McAvoy, Broadbent and Nighy, who all adapt splendidly to the animated medium. The story speeds along at an over-caffeinated pace, which nearly makes for sensory overload when coupled with the 3-D visuals. But, it also knows when to slow down and balance the silliness with sentimentality. 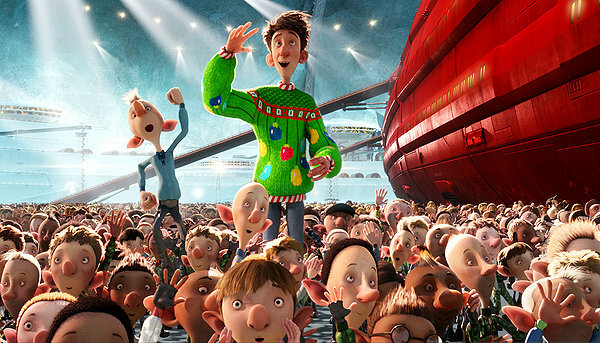 Clever enough to support repeat viewings, Arthur Christmas is a cinematic gift that keeps on giving.